Herb Brittner's Smokehouse, Inc. has been serving the Zelienople area for over 30 years. Herb is the third generation to manage this local family owned meat business. Still using some of Grandpa Brittner's classic recipes, along with a few of his originals, Herb's customers rave about the quality of his products. The numerous awards he has won from PAMP and AAMP that line the walls of the store are a testimony to the pride Herb takes in serving his customers. 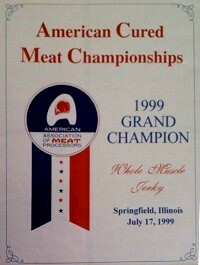 The Beef Jerky was even voted the best in the country in 1999! © 2019 Herb Brittner's Smokehouse, Inc., all rights reserved. All images on this website are property of Herb Brittner's Smokehouse, Inc.
Website designed by Herb Brittner III.